Emily and Sabrina founded Sunuva in 2007 after meeting on holiday and by chance their children knew each other from nursery. Sunuva was founded over mutual frustration at the lack of stylish and protective swimwear for children. The brand was founded offering UV protective swimwear along with clothing to be available all year round. 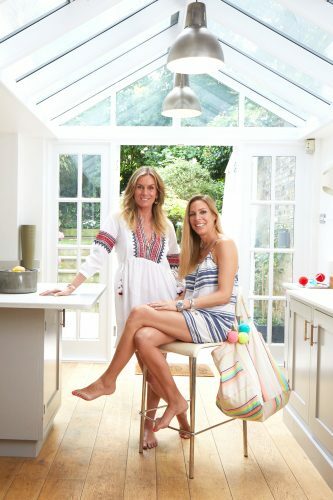 Since launching Sunuva, Emily and Sabrina have established a global fashion brand for children that is stocked in major department stores and boutiques worldwide. The range now includes teen, women’s and menswear styles. Emily already had start up experience after starting her career working in PR and was one of the three entrepreneurs behind cosmetics brand Pout as well as a consultant for Sir Philip Green. Pout went on to be sold to the owner of Victoria Secret. Following the sale Emily worked with Sir Philip Green and Topshop consulting on a new cosmetics range for Topshop. Prior to co-founding Sunuva Sabrina previously worked on a costume jewellery business that supplied the high street and prior to that had trained as a chartered accountant. Sunuva have just celebrated their 10th anniversary after starting the brand by hosting private sales which provided a chance meet with a Harrods buyer through a mutual friend. Harrods to this day are Sunuva’s largest stockist. Sunuva is available from major department stores around the world including Harrods, Selfridges, Fenwick, Harvey Nichols, and Bloomingdales, as well as independent boutiques, luxury resorts worldwide such as The Four Seasons and The One and Only. The brand has a growing A list celebrity following including the Beckhams, Madonna, Gwen Stefani, The Cowells and has been worn by Prince George. I co-founded Sunuva ten years ago with Emily after we struggled to find well designed UV protective swimwear that didn’t have cartoon characters all over it. Today we’ve grown the brand into a gorgeous lifestyle brand that provides everything that kids need for their summer holiday wardrobe. Together, Emily and I are the creative behind the brand, designing all the prints and garments as well as working on the strategic direction of the business with Bunty, our Managing Director. I had a professional training with PWC but since then I have followed an entrepreneur’s path. Prior to Sunuva I had a white label costume jewellery business selling to high street chains. Only at the beginning when I worked for PWC. I knew that being a chartered accountant wasn’t my long-term career, but I wanted to gain a professional qualification and a strong commercial training. The rest of my career path has been dictated by life’s circumstances. An entrepreneur’s path is full of challenges and that’s what makes it exciting! Whether dealing with production issues, managing cashflow, finding the right strategic partners, managing the family juggle (and the list goes on…) everyday brings something new to deal with and, over time, we’ve learnt how to deal with them without becoming too stressed. We are mentored by our Chairman, Peter Kenyon and I also come from a family of entrepreneurs which was particularly useful early on. I would love to have the time to mentor but unfortunately, it’s not an option at the moment, although I often meet people who ask for some time on a one-off basis. Perhaps it is the nature of our business, but we already have a fully diverse team and similarly we have diversity in our photoshoots. It is not something that we make a point of considering in our business because it happens naturally and I would hope that it would continue to do so. As a mother of four, the biggest issue for me is being able to attend parents evenings, school plays etc. As long as there is flexibility to juggle the work/home balance, I’m happy! Without doubt Prince George wearing our t-shirt in his official 3rd birthday photo! Not only was the impact on our sales and profile huge, but it’s also so exciting to think that a piece of Sunuva could be a part of future history! One of our next big challenges is to conquer America both online and in stores. We feel that our brand has still so much more to achieve and we are currently putting in place the strategies to make sure that we do so!